The Brooklyn Nets have a new home and they want you to take the subway there. Mayor Bloomberg revealed that that's how he got to the brand new Barclays Center on Friday as he unveiled it along with Forest City Ratner Companies Chairman and CEO Bruce Ratner, Brooklyn Nets Owner Mikhail Prokhorov, Brooklyn Borough President Marty Markowitz, Barclays Executive Chairman of the Americas Thomas L. Kalaris, Barclays Center and Brooklyn Nets CEO Brett Yormark, and other city leaders. Designed by AECOM and SHoP Architects, the LEED Silver-seeking, state-of-the art facility will open to the public on September 28th with the first of eight completely sold-out Jay-Z concerts but if you can't wait until then, take a sneak peek of the gorgeous public plaza, the owner's suite, Jay-Z's 40/40 Club (still under construction), the Net's practice court and of course, a Barclays Center-shaped cake. The new Barclays Center Arena marks the return of major league sports to Brooklyn, which has had a hole in its heart since the Dodgers moved to Los Angeles in 1957. It was all smiles at the press launch but long and arduous process behind the project was by no means a pleasant one. Local residents fought long and hard (many still protesting at the preview) about the use of eminent domain as well as multiple lawsuits and financial issues plagued the Barclays Center and larger Atlantic Yards program for years but now the 675,000 square-foot arena is nearly complete with just a few remaining pieces such as Jay-Z’s 40/40 Club, which will (goodness willing) be ready for his first concert on the 28th. SHoP Architects and AECOM designed the Barclays Center to LEED-Silver standards, but one of its most sustainable aspects lies outside of the building itself. The message of public transportation was resounding at the opening, and subway access to the arena has been at the heart of the project since the beginning. Nine subway lines, 11 bus lines and the Long Island Rail Road will stop at the Barclays Center and train travelers will be able to completely bypass all of the extremely congested traffic on street level. A trip from Wall Street on the 2, 3, 4 or 5 will take about 10 minutes and those coming from Penn Station on the 2, 3, or C or Grand Central on the 4 or 5 will need about 22 minutes. If you’re commuting from Coney Island on the D, N, Q, the ride is about half and hour and Queens people can get to the center in 20 minutes on the LIRR from Jamaica. The Barclays Center will also add to the economic sustainability and viability of Prospect Heights by hiring approximately 2,000 people (many from the surrounding neighborhood) to work in the arena. Staff members are being trained by Disney Institute, the business advisory arm of The Walt Disney Company, and we would like to give a special shoutout to the amazing and hardworking folks who worked on Friday. The service was warm, impressive and above-and-beyond, something that is difficult to find in New York City. The new Barclays Center Arena marks the return of major league sports to Brooklyn, which has had a hole in its heart since the Dodgers moved to Los Angeles in 1957. The Starbucks at the front of the arena has seating made of old basketball court floorboards. The facade is made up of 12,000 unique panels that were fabricated from woven weathered steel sheets. As you approach the building from the public plaza outside, you'll notice a dramatic canopy with a large oval oculus streaming a 3,000 square foot, 360 degree LED marquee. Inside the largest suite the Barclays Center has to offer. It belongs to the owner though so it's not for sale. It was all smiles at the press launch but long and arduous process behind the project was by no means a pleasant one. Local residents fought long and hard (many still protesting at the preview) about the use of eminent domain as well as multiple lawsuits and financial issues plagued the Barclays Center and larger Atlantic Yards program for years. But now the 675,000 square-foot arena is nearly complete with just a few remaining pieces such as Jay-Z's 40/40 Club, which will (goodness willing) be ready for his first concert on the 28th. “The opening of Barclays Center is the culmination of my dream for Brooklyn to bring a national professional sports team back to the borough for the first time since our beloved Dodgers left for ‘La La Land’ more than 50 years ago,” said the always eloquent Brooklyn Borough President Marty Markowitz. The practice court where the Brooklyn Nets will be working on their shots. It was turned into an event space temporarily - dual purpose! The 40/40 Club was still being built when we visited. 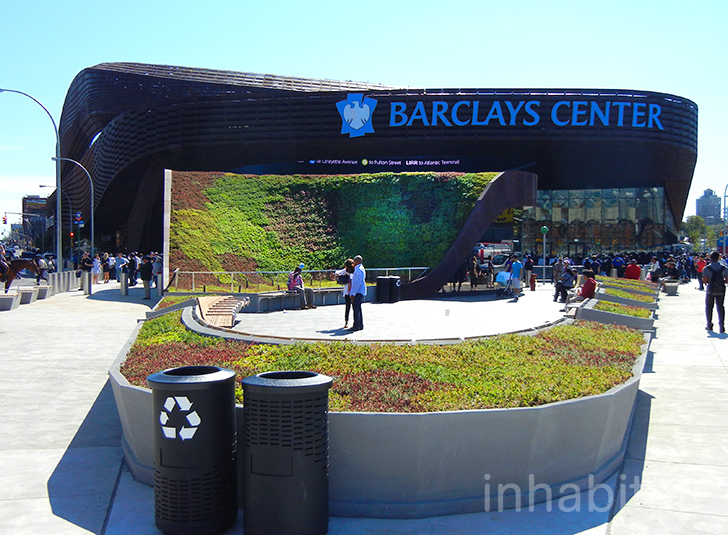 SHoP Architects and AECOM designed the Barclays Center to LEED-Silver standards, but one of its most sustainable aspects lies outside of the building itself. The message of public transportation was resounding at the opening, and subway access to the arena has been at the heart of the project since the beginning. Nine subway lines, 11 bus lines and the Long Island Rail Road will stop at the Barclays Center and train travelers will be able to completely bypass all of the extremely congested traffic on street level. A trip from Wall Street on the 2, 3, 4 or 5 will take about 10 minutes and those coming from Penn Station on the 2, 3, or C or Grand Central on the 4 or 5 will need about 22 minutes. If you're commuting from Coney Island on the D, N, Q, the ride is about half and hour and Queens people can get to the center in 20 minutes on the LIRR from Jamaica. The giant scissors used to cut the ribbon at the Barclays Center on Friday. Foodies will find offshoots of some of their favorite Brooklyn nibbles inside the arena. There will also be eateries named after popular Brooklyn nabes such as Park Slope and Williamsburg. Inside the VIP entrance to the Calvin Klein Courtside Club. Behind the blue curtain at Jay-Z's 40/40 Club inside Barclays Center. The Barclays Center was built with sightlines in mind. Even those in the "nosebleed" section can enjoy wide views of the court.